Starting off 2014 I have high expectations this year for results. A lingering injury prevented me from fully training the way I wanted to but it finally worked itself out. I focused on swimming this winter which really helped me improve in that area. The bike is all dialed in with great add-on’s from World Wide Bearings, Polydyn and HED wheels. The bike is weighing in at 19.5lbs now, and with a few more upgrades it could be at 19lbs. The off season yielded a few new sponsors. 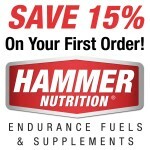 Hammer Nutrition was a very welcome addition and my nutrition needs are being met much better than last year. Timex helped me keep on pace during the bike and run. The Global GPS Trainer is a really cool tool and the customizable screen is great. So I can see the details I want during the run and bike. Bont shoes really helped out in the transition and fit well. The race started in chilly 63 degree water and learning a few tricks from last year taught me to wear 2 swim caps. Every race has a mandatory cap for the race you are in. I had a good swim and felt really good. I tried to use the draft but may have focused too much on that instead of just swimming my own race. Coming back to shore after the final turn buoy the wind was really strong. This slowed a lot of people down and it was a challenge. But to compare from last year, I still beat my time and felt really good during the swim and out to the transition. I was not so winded and I attribute this to the Hammer products I used. Transitioning to the bike was helped out with the new Bont triathlon specific shoes. The shoes are easy to get into and out of so it really helps on the bike. Plus the stiff carbon fiber sole helped with power transfer. I’m familiar with the this course and knew where I could push a bit harder but there were some very fast bike times laid down. This race always brings out some serious riders and bikes with full disc rear wheels, which I don’t have and those wheels really help out with overall aerodynamics and speed. I was able to post an average speed of about 22mph, but the top finishers were in the 24 range. The bike ride was good for the first race of the year. I still need to get back to my level from the end of last year, but I’m close. Running was a challenge as I have not been able to train for the run like I wanted to. Overuse and stress on my Achilles has been any issue all winter. I was able to figure out how to heal it but those training days slipped by this winter and put my training off schedule. I was not at the pace in the race I wanted to be at, but it will come back fast. I was able to manage 23rd overall, but to my excitement I got 3rd in my age group. I was 10 minutes off my PR for that race course but for the first race of the year with limited training I was happy with the result.